This week Sunday Supper is taking those restaurant favorites and making them at home. To answer the call of copy cat recipes I had quite the plethora of favorites I’d like to try, but thanks to Pinterest my desire to make a Bloomin’ Onion was too strong to pass up. Thanks to Coleen of The Redhead Baker for hosting this fun event. Be sure to scroll past my recipe to see a menu of Copy Cat recipes. As is true with most Pinterest finds, this endeavor was much harder than it looked. I gave the Bloomin’ Onion two attempts before succumbing to onion petals. 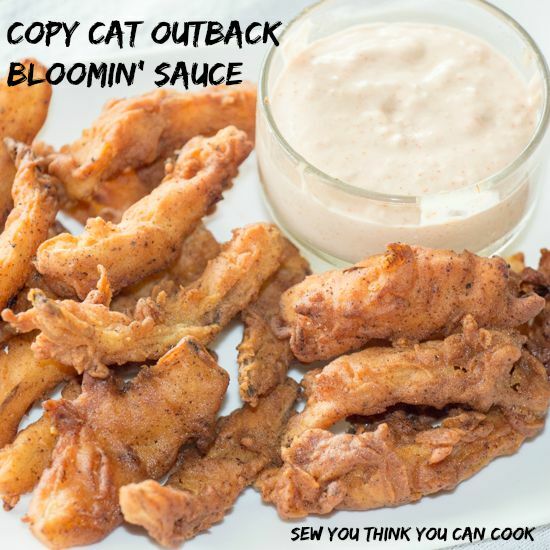 The Copy Cat Bloomin’ Sauce though, was spot on! 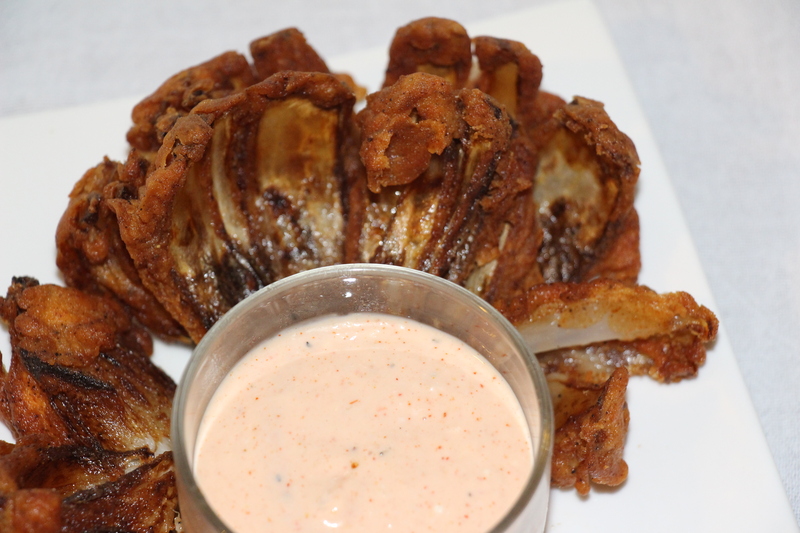 I contemplated baking the Bloomin’ Onion, but I figured, if we’re going Copy Cat we’re going to fry it! The amount of clean up required reminded me why I don’t fry foods! The amount of deliciousness made me want a deep fryer. I’ve at least figured out a way to dispose of the oil. I keep the empty oil bottle and once the oil is cool, return it to the bottle. It is then contained and easily disposed. I do this with all cooking fat, I keep a bottle in the freezer and add to it until I buy a new bottle of oil. I then toss and repeat. Attempt 3: To cut the petals, I followed the same steps for cutting the Bloomin’ Onion and then chopped off the bottom portion so the petals would be on their own. I still tossed them in the flour mixture, then the batter, followed by another dip in the flour, before frying in batches for 3 minutes. Ultimately, I think the beer batter was just too thick. I used a local Pale Ale. I don’t claim to be a beer expert but maybe a lite beer would be better? Or maybe add more than 1 bottle? If you’ve tackled the Bloomin’ Onion, please let me know if you had a Pinterest success or a Pinterest fail! To make the sauce, whisk together all ingredients. Make the seasoned flour: Whisk together 2 C flour, 4 tsp paprika, 2 tsp garlic powder, 1/2 tsp black pepper, and 1/2 tsp cayenne in a shallow bowl. Make the beer batter: Whisk together 1 1/2 C flour, 1/3 C cornstarch, 2 tsp garlic powder, 2 tsp paprika, 2 tsp black pepper, 1 tsp salt in a shallow bowl. Stir in the beer until combined. Cut about 1/2″ off of the top of the onion. Peel the outer layer. Very carefully cut the root hairs off the onion, but leave the root in tact. Cut 12-16 vertical wedges into the onion, being sure not to cut down through the onion. If you’re attempting the Bloomin’ Onion carefully and gently separate the layers. If you’re making petals, cut the bottom of the onion off and separate the petals. Fry at 375 degrees F for 3-4 minutes, flipping halfway through. If you’re attempting the Bloomin’ Onion, place onion cut-side down to start. Remove onion to a paper towel lined baking sheet to drain. I’d be more than happy with onion petals! They look fantastic!!! I had one of these once at Outback it was pretty good. Can’t wait to try at home maybe for a summer BBQ party. So happy you loved my sauce as much as we do! We put the leftovers on burgers the next day, too! I have the upmost respect for this post because I’ve written it in the past myself: Instead of publishing a perfected dish, you’ve decided to publish the reasons why your dish wasn’t to your satisfaction. Keep at it. You’ll get that perfected onion eventually. Thanks. 🙂 At least I still got delicious onion petals out of it. I’m with Liz! I’ll take the petals any day and this dish looks amazing! YUM! And I too agree with DB! I love hearing other people’s challenges — it’s inspiring for me. Great post! I agree, the petals are just as good, and your dip~yummo! Can’t wait to try this! I certainly commend you on trying to recreate the bloomin onion! Sometimes things don’t turn out … but that’s okay. I love your idea for getting rid of oil – I will definitely use that. Thanks. And I got the idea from my MIL. She uses cans instead. I like being able to close the canister and it’s longer use. I love bloomin’ onions! Great recipe! Petals are easier to eat anyway 🙂 Looks good! Thanks for the tip about saving the oil bottle! That is a genius! I’ve never been as brave as you to attempt the bloomin’ onion, but I do love to eat them! I totally agree that frying is not worth the clean up, but now that I have that tip about the oil I just might be more inclined. Thanks! Thanks! Just remember to let the oil cool or you’ll have a new dangerous kind of mess! I want to try this recipe. I think this would be so much easier than trying the whole onion. Your petals still look quite delicious!